Please don't tell Beaujolais, but I'm cheating on it. In its big month and everything. I should feel horrible since I'm running around with a wine that a lot of people still consider cheap, sweet soda. But Lambrusco is different now. It's not the wine it used to be. It's having a revival and I'm here for it. Flashback to a few months ago... I put myself in charge of picking out wine for a BYOB Italian meal at Piccolo Forno with my parents, sister, and brother-in-law. My brother-in-law instructed my sister to "make sure" I was selecting a good wine. As if there was a chance I would bring a deadbeat, he said, "Make sure she doesn't bring Lambrusco." I let her know that I was bringing a different friend, Nero D'Avola, but seriously, what was his issue with Lambrusco?! Like too many people, he associates it with just one brand: Riunite. Which is honestly fine if you're on a tight budget in college (been there) or simply enjoy sweet jug wines (no judgement here!). But would I seriously bring a gallon of it to a nice meal? No, but I would in fact bring a delicious bottle of worthwhile, underrated Lambrusco. 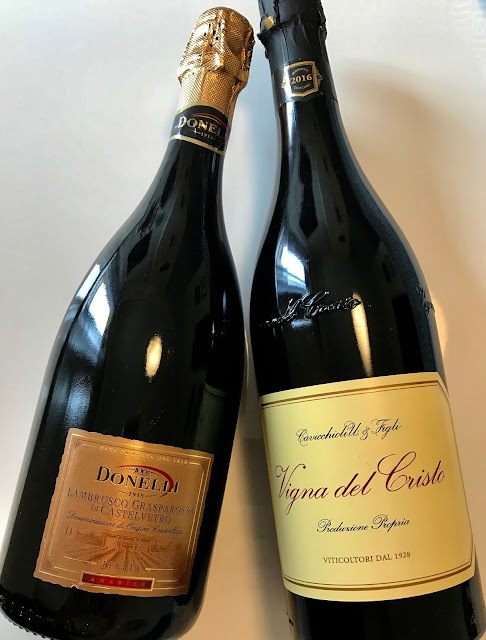 Bottles of Lambrusco Grasparossa di Castelvetro and Lambrusco di Sorbara. 1. It pairs well with Parmigiano-Reggiano, aka cheese crack. Both are from the Emilia-Romagna region of Italy. A place high on my travel wishlist due to aforementioned cheese crack. 2. Typically made in a frizzante style, this bubbly is budget friendly thanks to its poor reputation. New, respectable Lambrusco is a steal at $10-$20/bottle. 3. It comes in several varieties, including secco (dry), semisecco (off dry), rosato (rosé), and rosso (red). 4. It tastes delightful chilled. As someone who drinks iced coffee year round, I live for chillable red wine. Frizzante (adj. ): Slightly effervescent. Wines labeled "spumante" are fully sparkling. No offense to my Italian ancestors, but Italian wine naming is totally out of whack. Some of their wine names are grapes, some are appellations, some are both. In Lambrusco's case, it is both a group of grapes and a wine. As for its DOCs, there are eight: Colli di Parma Lambrusco, Lambrusco Grasparossa di Castelvetro, Lambrusco di Sorbara, Lambrusco Salamino di Santa Croce, Reggiano Lambrusco, Colli di Scandiano e Canossa Lambrusco, Modena Lambrusco, and Lambrusco Mantovano. While the tasting profile ranges across the DOCs, count on Lambrusco to have dynamic fruit flavors and medium body, tannin, acidity, and alcohol. The panoramic range of colors and styles is incredible but they all hark back to their Lambrusco roots. You'll notice most have flavors of youthful strawberry, raspberry, cherry, violet, and fresh cream. My personal favorite DOC is Grasparossa di Castelvetro for its big flavors, light bubbles, and moderate tannin. This is the bottle that got my eye wandering. As the name suggests, it's a dry rosé from DOC Grasparossa di Castelvetro. For $16.99, I wish I could find more of it. I've cried every day since it left me. It was a pink blizzard of tiny bubbles full of fresh raspberries, strawberries, and cream. I hope it remembers me fondly, too. My lost but not forgotten summer love on left. 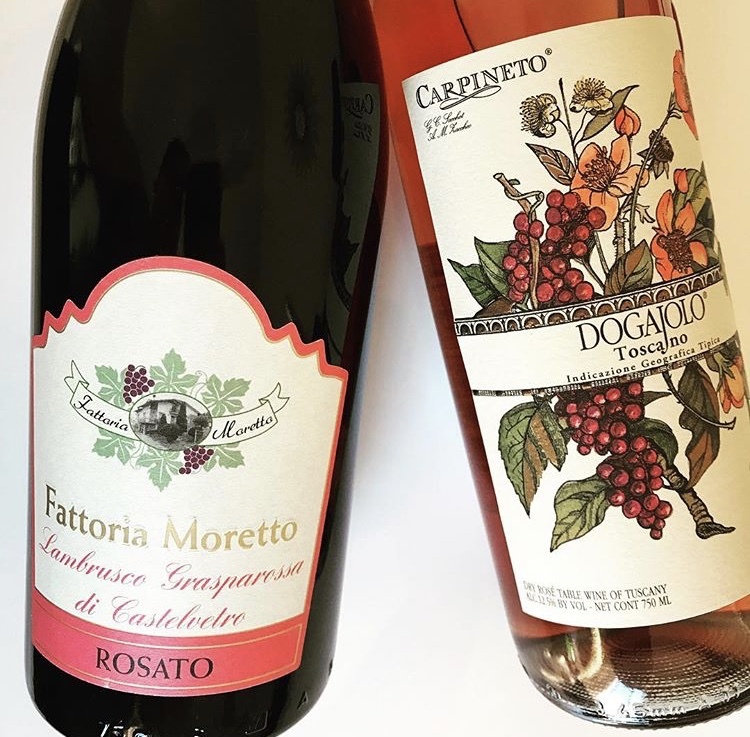 On the right, some Tuscan rosé. Three words: frozen strawberry lemonade. I wasn't expecting this level of citrus from a Lambrusco but there it was, hitting me in the face the moment I popped the cork. In addition to fresh strawberries and tart lemon, there was also some raspberry and slight earthiness in the mix. This refreshing, rosy wine was $9.64 and had a fair amount of acid but very little tannin. My second tryst with Grasparossa di Castelvetro did not disappoint. 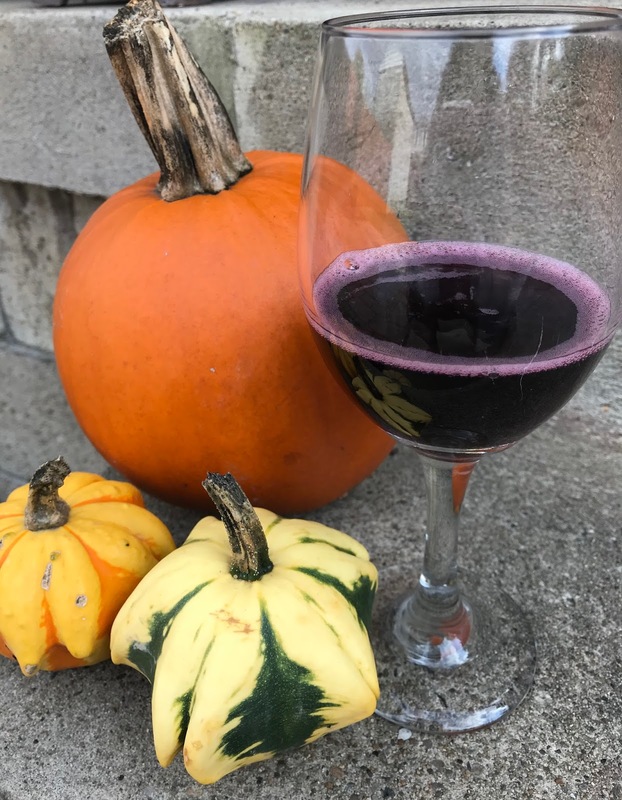 It was much different from the other two that I tasted for this post, showcasing Lambrusco's diversity. This creamy fruit bomb exploded and left raspberries and blueberries in its wake. Tiny purple flowers poked through the bomb's destruction but I could barely find them among the juicy fallout. This wine could have used a bit more tannin for added complexity but for $10.99, I can't complain. My sister also tasted the Donelli and said, "It tastes like better Lambrusco." Maybe this former loser can prove it deserves a second chance after all? How beautiful is that color?! This is the Donelli Lambrusco. 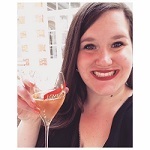 Have you had a fling with Lambrusco? It's time!